The Precision Pet Extreme Outback Log Cabin Dog House has many attractive and beneficial features. Here are just some of the features that can increase the happiness of both you and your dog. 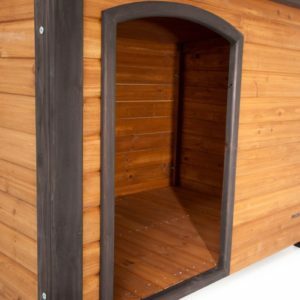 This log cabin doghouse offers what any dog enjoys about a doghouse. It has a single, extra-wide entrance that serves as a way for your dog to see who is coming and still guard your yard with ease. It provides a sheltered cover from rain, show and the hot sun. Yet, this house has a style that will enhance any yard. Its slanted shingled roof directs water to the back of the house. The raised wooden floor rests on four self-leveling plastic legs, providing greater warmth. The natural cedar finish allows the house to blend in with the natural landscape of most yards and outdoor furniture. A side entrance door and dark trim add to this pet shelter’s unique charm. 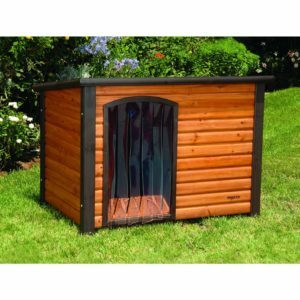 The Precision Pet Extreme Outback Log Cabin Dog House is completely made from solid wood and stainless steel hardware, making the unit very durable and sturdy. The wood is fir, which is naturally weather resistant. Stained with cedar, this doghouse is resistant to mold and mildew. Known as a natural pest repellent, cedar also offers the added bonus of repelling fleas. Solid fir makes the shelter extra sturdy, maximizing longevity of use against weather elements and pests. The difference between the Precision Extreme Outback Log Cabin (the dog house series in this review) and the Precision Outback Log Cabin is that the Extreme version has improved weather proofing on the roof shingle material and feet protection. The Extreme has black asphalt shingles to protect against extreme weather conditions, while the non-Extreme just has solid fir wood shingles with a green stain. The Extreme also includes plastic caps for the feet to protect them from moisture. This log cabin comes in four sizes, which accommodates most dog breeds and sizes. The given dimensions only pertain to the outside of the dog house, not the interior. When choosing a size, it is best to take off a few inches for each dimension. Bigger is better when choosing a dog house. You should choose a size big enough for your dog to walk in and turn around comfortably. The doorway for this dog shelter has no given dimensions. From the various pictures, it appears to be two or three inches shorter than the house and narrow. The doorway is off-center, allowing your pet to move away from blowing rain or snow and winds. The doorway is wide enough to accommodate most dogs comfortably sticking their head and paws out the doorway to watch the entire goings-on in the neighborhood. 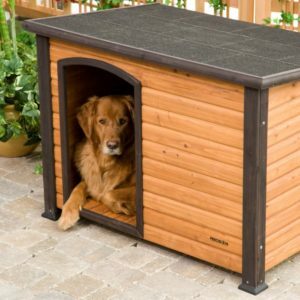 The Precision Pet Extreme Outback Log Cabin Dog House does not come with a door. Most dogs like the freedom to look out their doghouses. However, a door can be purchased for your Log Cabin as an accessory. Small: Dogs up to 25 pounds. Yorkie, Chihuahua, Shih Tzu, Pug, Dachshund. Boston Terrier, Beagle, Cocker Spaniel. Large: Dogs up to 90 pounds. Bulldog, Basset Hound, Husky, Labrador, Boxer, German Sheperd Dog, Rottweiler. Giant: Dogs up to 200 pounds. 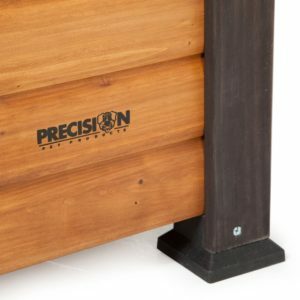 The Precision Pet Extreme Outback Log Cabin Dog House is not insulated. Additional padding or a dog bed can be purchased in addition to the house. 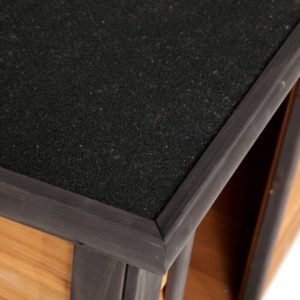 It does have a raised floor for added warmth and protection against the wet grass or soil. The main ventilation for this doghouse is from the off-centered opening in the front of it. The extra wide opening allows for added ventilation to keep the airflow circulation, so it should never get too stuffy inside the structure. On an additional positive note, the angle of the doorway keeps out most drafts and extreme weather. Additional ventilation comes from under the doghouse. Adjustable legs keep the unit dry and allow air to circulate from under the floor panels. Side panels attach to the front and back panels. Four legs attach to the corners of the dog shelter. The floor comes in three sections. They drop in and fit perfectly together. The roof comes in one solid piece. It is laid on top of the dog house. The only tool required is a screwdriver. The assembly kit comes complete with wood screws and bolts to secure the doghouse. Legs can be adjusted to increase the gaps between the floor of the unit and the ground, allowing for adjustments to variety depending on the height of the grass. Due to the adjustable legs, this doghouse can be made to sit level on any type of surface. Additional accessories can be purchased to make your dog more comfortable in his new home. This heavy plastic door is separated into soft strips. This door is available in three sizes and covers the full length of the doorway. The door accessory helps to keep the interior of the Precision Pet Extreme Outback Log Cabin Dog House warm and dry. In summer months, it can be easily removed. This door comes in handy in case of bad weather while you are away from home. In addition, it can be installed for when the doghouse is not in use to keep out other animals and pests. Precision has solved the issue of insulation with this kit. This insulation kit is a godsend for being an easy way to add insulation to your doghouse, saving the time and expense of trying to solve the problem on your own. The insulation kit has one zipper and Velcro attachments for easy installation. The two-layer canvas cover is removable to wash off. Its triple-layer polyfoam will make sure your pet is warm during the coldest of weather. What would a product review be without checking out what customers are saying? For the most part, the Precision Pet Extreme Outback Log Cabin Dog House reviews have been good. The log cabin style seems to be a big hit with dog owners. They love the unique style of the cabin and the fact that dogs are naturally attracted to its extra-wide doorway. Customers also love the easy assembly. In case you lose the three-step instructions, you can find them online. During my research, I did find some disconcerting reviews about the stability of the log cabin dog house. Some customers commented that it did not hold up very well. I am not sure if this is from improperly putting it together or manufacturer defects. There is a return policy. I also found comments about damaged parts. Again, the customers were not clear whether this was a manufacturing issue or if the package was damaged during shipping. You can read customer opinions here. For the price, this dog house is a good buy. Even with the extra expenses of the insulation kit and the door flaps, the cost is less than some I’ve seen. 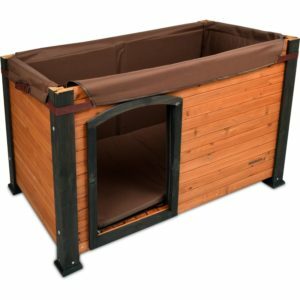 The Precision Pet Extreme Outback Log Cabin Dog House has a lot to offer dog owners and their pets. The cons are few and easy to fix or avoid. The Log Cabin Dog house assembles easily in three simple steps. Once completed, you have a beautiful cedar-stained log cabin every dog in the neighborhood will envy. Adjustable legs allow you to control the height between the house and the ground. Natural wood materials make a non-toxic home for your pet. Easy to clean with a cloth and some water. This doghouse is available in four sizes. This makes it a great choice for multiple dogs. 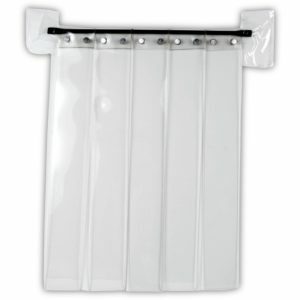 The off-centered door prevents blowing snow and rain from hitting your pet. Cedar staining makes the dog shelter pest and mold resistant. With controlled ventilation, your pet will not be exposed to unnecessarily cold drafts. Great accessories such as the insulation kit can enhance the doghouse and make it more comfortable for any dog. 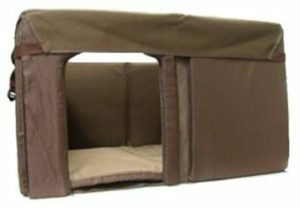 The Precision Pet Extreme Outback Log Cabin Dog House does not come insulated. You must purchase an insulation kit separately. Wood is not as durable as other materials. The cedar staining may smell strongly at first. You may need to air it out before introducing your pet to his new home. I wish I had seen this house before we built one for our big dogs. I love the rustic log cabin look, but I am not entirely thrilled with the materials. Wood is just not as durable as other materials. The asphalt roof might also eventually need repair as well. The insulation kit is something I have not seen before. I think it would be good purchase ONLY if you don’t have dogs that will chew it or shred it to bits. It might be durable, but so far I have yet to find anything completely dog-proof. 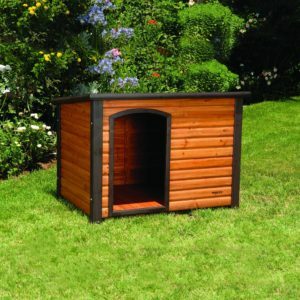 Overall, I think the Precision Pet Extreme Outback Log Cabin Dog House is a good product for the price. I can’t list the Precision Pet Extreme Outback Log Cabin Dog House prices here because they may be subject to change or discount promotions, but you can just click on the appropriate size to see what Amazon.com has it priced as today.